The primary mission is education: the Hyperreal Music Archive seeks to facilitate, directly and indirectly, increased awareness and understanding of electronic music -- the recordings that are being made, the artists who are making them, and the machinery they use. The Hyperreal Music Archive is a collection of locally-hosted informational resources: web sites, plain text documents, email discussion lists, and digitized sound recordings, all aligned with this mission. contemporary dance-oriented and listening music that is created more or less entirely with electronic instruments and electronic sound manipulation devices. Since its inception in 1992, the HMA has served as an invaluable resource for rave-related musical genres: techno and ambient --and to some extent, drum & bass, acid jazz, and trip-hop. Although it focuses on these styles, it is understood that no form of music exists in a vacuum. No content is going to be included or excluded on the sole basis of its relevance to this week's list of fashionable genres. Note: Some of the resources in the HMA are not closely affiliated with Hyperreal. Hyperreal may only be hosting them temporarily, or they may be mirror sites or special archives for resources officially housed elsewhere. Due to the draconian climate surrounding intellectual property issues on the Internet, and Hyperreal's high profile, much of the freely available music samples have been removed from the archive. Most of the music that remains is provided by and/or approved by the labels themselves, or falls into the category of mixed DJ sets. The DJ sets are not exempt from licensing requirements, so they are now (or will soon be) transmitted from a fully licensed provider. 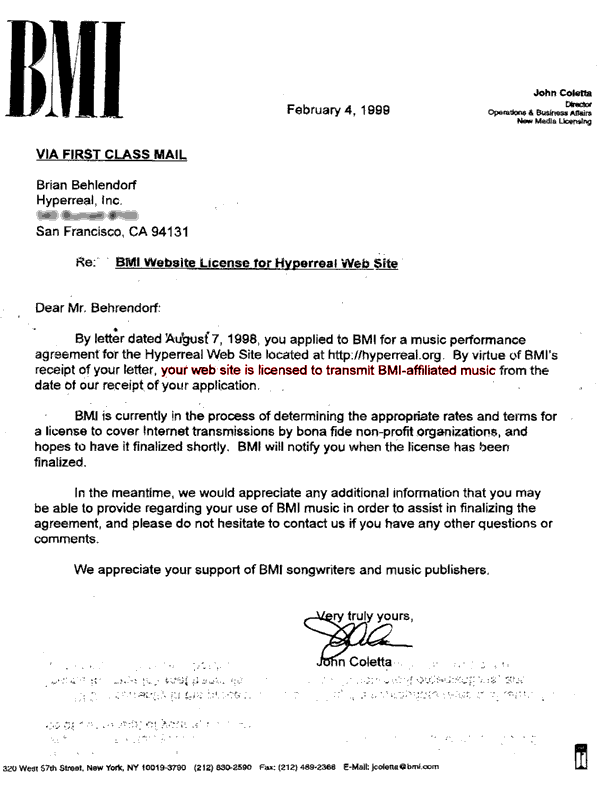 Attempts to procure fair licensing for Hyperreal have only resulted in one license granting permission to transmit BMI-affiliated compositions. This license is useless without a license to transmit actual sound recordings, and the major labels pretty much only allow DMCA-compliant broadcasts (unpredictable streams, not freely available songs for download on demand). Although it is not impossible to get licenses, they tend to be costly in terms of money and labor. The licensing agreements are also very poorly written and reflect the music industry's ignorance of networking technology. There is no way I would ever sign the contracts like the one ASCAP sent, for example, even if I could afford their outrageous pricing model. 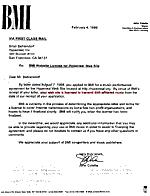 The Director of the Hyperreal Music Archive and author of this document is MIKE BROWN. Much of the archive's content, however, is not under his control. About 60 volunteers maintain their own sections, or collaborate with each other. And the mailing list archives are maintained semiautomatically. It is too difficult to maintain contact information for the dozens of individuals who manage all the different parts of the archive. Your best bet, if you are trying to contact someone regarding adding, removing, or correcting something in the archive, is to go to the section in question and look there for contact information for the person in charge. If you merely want to ask for a link to be established between a web site that you maintain and Hyperreal, you need to go to the appropriate Links Page and go through the necessary channels. If you don't do this, your link request will be ignored. Due to abuse by spammers, direct contact with the Hyperreal Music Archive administrators is not encouraged. Use Hyperreal's main feedback form instead. Hyperreal Music Archive logo by Mike Brown, incorporating a photo by Doug Zimmerman. The photo is of the 12" single of Underworld - "Rez" on Junior Boys Own.